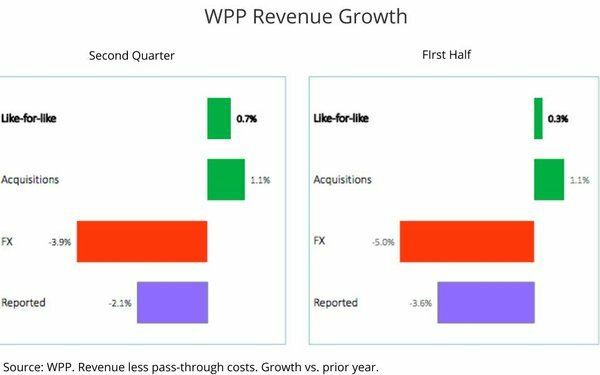 WPP said it posted organic net revenue growth in the second quarter of 0.7%, its first growth quarter since first-quarter 2017. Organic growth factors out the impact of M&A and currency fluctuations. The company -- which confirmed Monday that Mark Read has been appointed CEO after a five-month search -- posted a slight decline (0.2%) in reported revenue in the second quarter to £3.9 billion ($5 billion), which followed a 4% drop in the first quarter. For the first half, revenue was down 2.1% to £7.5 billion ($9.6 billion). After tax profits for the first half were up 11.3% to £705 ($905) million. Estimated net new business billings for the first half were $3.2 billion. New assignments came from Adidas, Hilton, Mondelez, Office Depot and T-Mobile. The company also said it expanded relationships with Danone, Mars and Shell. The holding company posted an organic net revenue decline of 3.1% in North America, its worst performance by region for the second quarter. The best performance by region was Western Europe, where organic growth was 3.9%. The UK came in at 1.4% and the other regions combined averaged growth of 2.9%. Read also said the company has divested of 15 companies (or stakes in companies) including Globant and AppNexus so far this year, generating £676 million in cash, and will continue to focus on the portfolio with an eye toward possible further divestitures. “We have accelerated initiatives that will simplify our organization, making it easier for us to manage and clients to access,” Read said. He noted, for example, the opening of campus-type locations in New York and other cities where multiple agencies and specialist units are now housed.